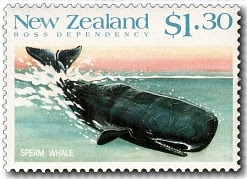 Since 1978 whales have had total protection under New Zealand law but whaling once flourished on our coasts. 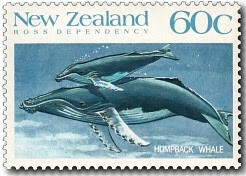 The coastal waters and oceans surrounding New Zealand were rich in whale life and attracted hunters from the Northern Hemisphere as early as the late 1700s. Shore whaling stations were first established in New Zealand in Cook Strait and Fiordland areas in the 1800s, with the hunters preying on migrating right whales and humpbacks. The whalers were some of New Zealand's earliest settlers and their exploits make a graphic chapter in the nation's history. 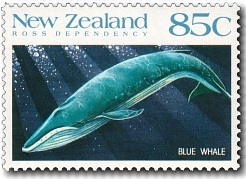 The last New Zealand whaling operation ended in 1964. This Baleen whale's most distinctive feature is its long flippers which are almost one third of its body length and often white. The small dorsal fin is stepped or humped. Coloured black or grey, humpbacks have flat rounded heads. Females can measure up to 16 metres, males slightly less. Humpbacks are tremendously athletic for their size and often leap clear of the water, rolling in mid-air with flippers extended before crashing back into the sea. They are the most acrobatic of the larger whales. Their numbers have dwindled now from 100,000 to 2,500 and they can be seen passing through New Zealand and Australian coastal waters twice yearly during migration to their breeding grounds around Tonga, Niue and Rarotonga. Despite its name, the toothed killer whale is actually a dolphin, the largest of the family at up to nine metres in length. It has a deserved reputation as a killer, hunting fish, sea lions, penguins, other whales - even the giant blue. The killer whale, or orca, was once an object of fear to humans but its marvellous performances in captivity and television documentaries have done much to modify such an attitude. It is observed intensively by scientists and whale lovers on the north-west coast of North America where pods or groups gather at certain times of the year. The torpedo-shaped animal is one of the most distinctive cetaceans because of its dramatic black and white colouring. The male, longer and much heavier than the female, has a striking long dorsal fin shaped like an isosceles triangle. The killer whale ranges the world and is common in New Zealand waters, sometimes cruising into major harbours and bays. 80c - Southern Right Whale. This Baleen whale is confined to the Southern Hemisphere below about 20'S, was almost exterminated by 1840. A very slow swimmer, it was an easy target for whalers, was oil rich and floated well after death. It became the 'right' whale to pursue, thus acquiring its name. Right whales have been protected internationally since just before World War II and in the past 20 years, the population has recovered to the extent that there may be several thousand. They are still uncommon in New Zealand waters but are seen more frequently now, suggesting a slow comeback. The female southern right whale, the larger of the sexes, grows to 18 metres in length and weighs about 50 tonnes. The species has a distinctive arched mouth and no dorsal fin. Little is known about the right whale's reproduction but the slow recovery in numbers and their three-year reproductive cycle suggest a slow breeding rate or high mortality. The majestic baleen blue whale is the world's largest living creature. Everything about this enormous whale is impressive. The length for the blue of the southern oceans, which is larger than blues north of the equator, is 25-30 metres - the largest ever recorded measuring 32 metres. Blue whales can weigh more than 150 tonnes which contrast with the average 5.8 tonnes of bull African elephant, the largest land animal. Blue whales, as their name suggests, are coloured a bluish grey. The dorsal fin is small and is positioned so far back on the whale's body that it is normally seen only when the animal dives. Blues live in open oceans throughout the world and migrate north and south - from warm tropical waters where they mate in winter to summer feeding grounds in polar regions. Migration is along routes that are well known and used regularly. They feed in relatively shallow water and live almost exclusively on krill, eating up to four tonnes every day such are their energy requirements. 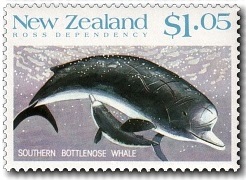 $1.05 - Southern Bottlenose Whale. Because the bottlenose has a beak and bulbous forehead it has the appearance many people associate with dolphins. Not a great deal is known about the southern bottlenose whale. It may be smaller than its northern relative and the colouring varies. Few have been seen and it has never been hunted commercially. Scientists do know that the southern bottlenose has a circumpolar distribution and it has been reported off New Zealand, South America, South Africa, Australia and in Antarctic waters. One writer says its northern limit was thought to be the 20's, but bottlenose whales seen near the equator in recent years may have been the southern species. The toothed bottlenose whale is a very sociable animal, never deserting wounded companions - meaning whalers were easily able to catch entire pods. This noble feature could be why there have been several strandings in New Zealand. The biggest of all the toothed whales, the sperm whale has a blunt and enormous head that accounts for as much as a third of its body length. It has a prominent underslung lower jaw. Males have been reported up to 18 metres in length but females are much smaller, not often reaching 12 metres. Both have a dorsal hump, two thirds of the way to the tail followed by a series of bumps or knuckles. The whale is named for the spermaceti organ in the head which produces a fatty wax-like substance thought to be involved in controlling the whale's buoyancy and enabling it to dive to depths of more than 2000 metres in search of squid and, around New Zealand, orange roughy. The whale can stay submerged for about an hour. Sperm whales are widely distributed in both hemispheres between 60'N and 70'S, migrating towards the poles in spring and returning in the autumn. 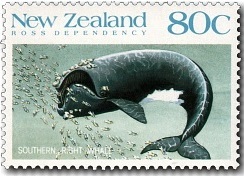 1988 Whales - First Day Cover.